Global stocks traded mixed while gold advanced and bonds held recent gains as investors reassess prospects for the major central banks to normalize monetary policy. The benchmark Treasury note's yield fell back to a one-year low. The Stoxx Europe 600 climbed, with retail and technology shares leading gainers. 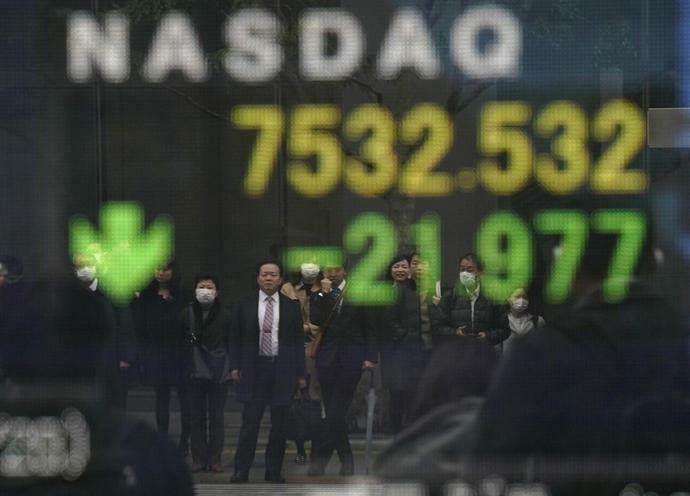 In Asia, a late-day turnaround put most benchmark stock indexes back into the green, from Japan to Korea and Australia. U.S. futures dipped after an S&P 500 Index rally hours earlier produced a broad-based advance. Japan's 10-year bond yield fell to the lowest since 2016, New Zealand's dropped below 2 percent for the first time and Australia's approached a record low -- all underscoring the return to globally low long-term rates after central banks showed no moves to tighten policies. Sovereign bonds in Europe bucked the trend to trade lower. The dollar steadied. Mild optimism that the Federal Reserve's dovish tilt can prolong the bull market for equities helped push the MSCI index of global equities up to its highest level since early October this week. Bonds, however, are signaling worries that momentum in growth and inflation remains subdued. Lower Consumer-price growth highlighted the struggles facing the Bank of Japan as some questioned its commitment to a 2 percent target. Trade talks between the the U.S. and China are scheduled to continue next week. "With the start of a global-easing cycle, the prospect of the resolution of the trade war, maybe some positive development on the Brexit front, we have the foundations and the catalysts for a revival of growth," Sandip Bhagat, chief investment officer at Whittier Trust Co., told Bloomberg TV in New York. "I wouldn't be surprised if growth, both of the earnings and economic variety, bottoms out in the first quarter. The market is now focused on the second half of 2019, where we see this revival." Elsewhere, sterling bounced off its recent lows as European leaders moved to stop a chaotic no-deal Brexit from happening next week, handing the U.K. an extra two weeks. The U.K. now needs to decide by April 12 what it will do next. The Stoxx Europe 600 Index rose 0.2 percent as of 8:06 a.m. London time.Futures on the S&P 500 Index fell less than 0.05 percent.The U.K.'s FTSE 100 Index fell 0.1 percent.The MSCI Asia Pacific Index rose 0.2 percent.The MSCI Emerging Market Index rose 0.1 percent. The Bloomberg Dollar Spot Index fell 0.1 percent.The euro rose 0.1 percent to $1.1388.The British pound advanced 0.3 percent to $1.3142, the biggest gain in a week.The South Korean Won declined 0.2 percent to 1,130.16 per dollar, the largest drop in more than a week.New Zealand's dollar advanced 0.2 percent to $0.6893, the strongest in more than six weeks. The yield on 10-year Treasuries fell one basis point to 2.53 percent.Japan's 10-year yield dipped three basis points to -0.069 percent on the biggest dip in 11 weeks.Germany's 10-year yield increased one basis point to 0.05 percent. Brent crude climbed less than 0.05 percent to $67.87 a barrel.Iron ore gained 1 percent to $81.98 per metric ton.Gold increased 0.2 percent to $1,312.57 an ounce, the highest in more than three weeks. U.S. automakers barely have a presence in Japan, the world&apos;s third-largest car market. Some blame protectionism, others cite the tastes of Japanese consumers and a lack of investment.